Thornleys Natural Foods are a family owned company whose mission is to provide the highest quality products which are 100% natural and delicious for all to eat; including those who must follow a gluten and wheat free diet and for those who prefer not to have chemicals, additives or preservatives in their food. This is a core principal of Thornleys and their range of sauce and recipe mixes stay true to these values. 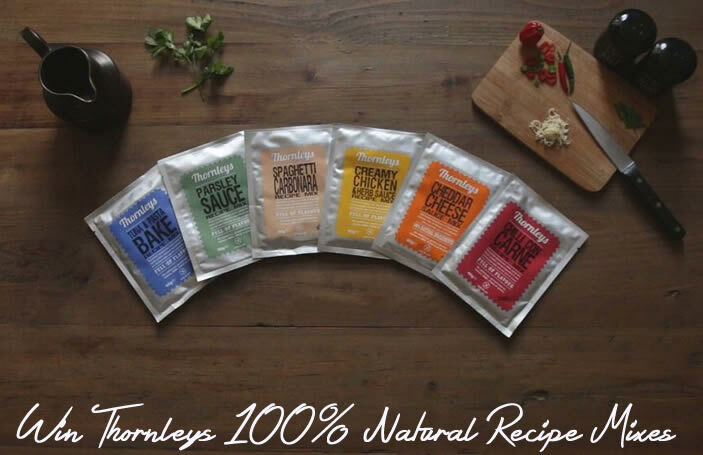 Thornleys presently have a range of six recipe mixes, blended using only the finest natural ingredients. Each product in the range has been approved by the Coeliac Association and is made using only natural ingredients that are free from additives, preservatives, colours, MSG, gluten and wheat. The range is perfect for those who want an alternative to chemically enhanced sauces. These recipe mixes are simple to cook, providing the whole family with the means to a quick, easy and delicious meal. We tried out some of the recipe mixes and liked them. My favourite was the Chilli Con Carne sauce. I used it in my regular veggie chilli con carne recipe and it added the perfect flavour. Not very spicy and so convenient to make. Perfect for those times when one doesn't fancy spending a lot of time cooking. The Parsley Sauce was also lovely - very creamy and delicious. If you would like to try out these recipe mixes from Thornleys, then here is your chance. One lucky winner will win the entire range of recipe mixes (pictured below) from Thornleys. Entry is very simple, via the Gleam widget below. All the best.